Our bed looks quite elegant with a large swath of light blue curtain material tastefully draped from close to the ceiling to both sides. The effect is spoiled somewhat by the washing hanging from the chandelier. I spent a little time this morning rubbing body lotion into my leather moccasins in an effort to prevent the leather from going hard after its soaking yesterday. The first order of business was to finish off the tourist stuff in Graz. We took a look at the cathedral - very ornate and pretty much over the top. 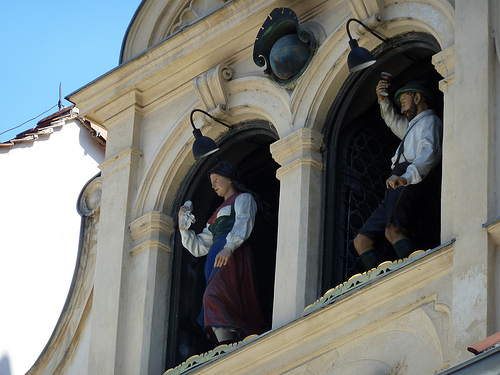 The next order of business was to see the double staircase at the Bourg Tower and then get over to the Glockenplatz to hear the bells and see the two mechanical people dancing. A pretty large crowd of tourists turned up but they were surrounded by three school group. The pickpocket who was standing just behind me decided to leave when I turned around and stood staring pointedly at him. The bells were pretty good and the mechanical dancers went on for quite a long time. The final order of business was the parish church which is very big and very ornate. 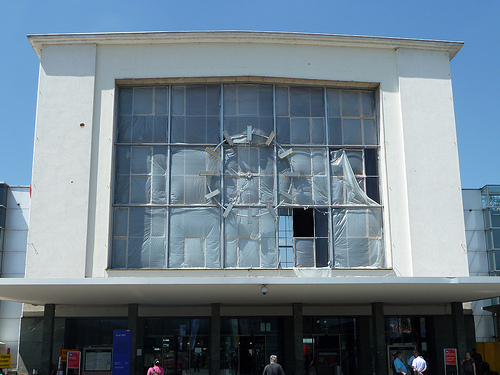 I was thus clear of tourist duties and made my way by tram to the station where there is evidence of the bomb blast last March - the whole of the front windows of the station including the clock have been blown out. 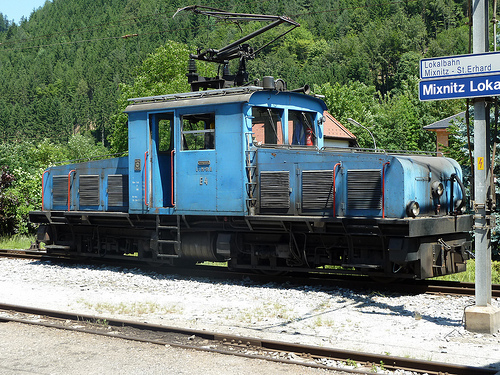 The reason for the trip to Mixnitz was to see what I could of the narrow gauge freight only branch to St. Erhard. 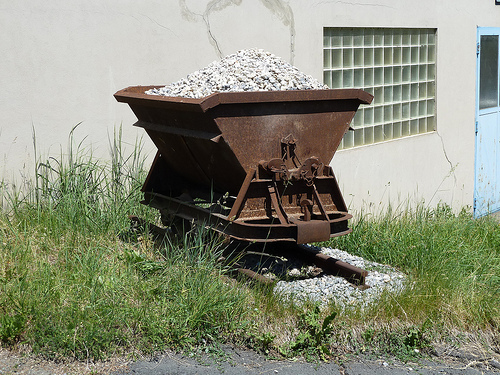 There was a shop with two narrow gauge (760mm) tracks and one standard gauge track. 1957 steeple cab electric #E3 was outside the shop and the other three were inside. #E1 and #E2 are four-wheel steeple cab electrics built in 1913. #E3 and #E4 are Bo-Bo steeple cab electrics built in 1957 and 1963. The standard gauge tracks held two switchers #VEL 1 and #VHL 2 which are used to switch the standard gauge sidings. 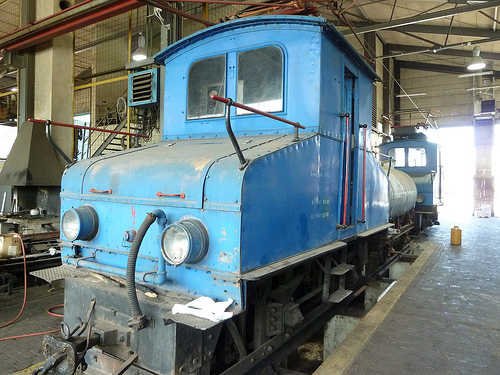 They were built in 1956 (diesel electric) and 1967 (diesel hydraulic) respectively. There were two men working around a flat car so I asked them if I could take pictures and I think they said yes. I took my pictures and didn't get in the way. Built in 1913 and still in use. 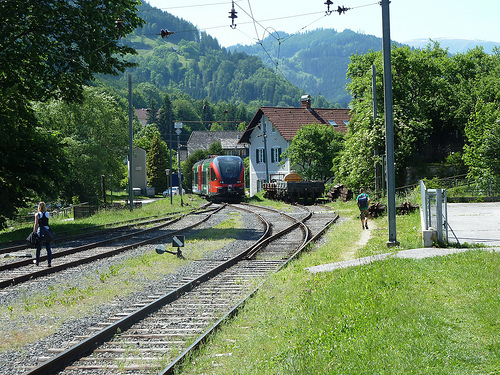 This line is under the Styrian state as is the short line from Peggau to Ubelbach. At Peggau I looked for somewhere to get a drink. I found a small bar near the station and ordered a beer. The barkeep was eating something out of an enormous salad bowl with a serving spoon. There was a woman sitting at the bar eating off a plate. When she finished she picked the plate up and licked it clean. Good job I didn't want to eat anything there - I think she was the waitress. 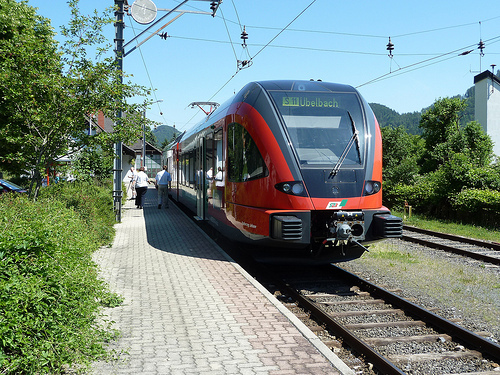 The Ubelbach line has just got two brand new railcars for the line which have replaced the four 1955 vintage units obtained from Switzerland second hand. The line is through very pleasant farming country with some arable fields, particularly with corn. The train was full with schoolkids. There was only some ten minutes at Ubelbach, unless I wanted to spend another hour there so I decided to come straight back. At Graz I took at look at the Graz Koflacherbahn diesels leaving as as it was very hot came straight back to the hotel. Dinner was at another great restaurant - the Landhauskeller which is in a beautiful courtyard by the Landhaus and underneath the Armoury. Mary started with pumpkin soup, Styria is famous for its pumpkins. Colin had the Styrian cold appetizer plate which contained chicken liver pate, fish pate, asparagus pate and other things including Styrian horseradish. For main course Mary had boiled beef which included a marrow bone, pickled pumpkin and potatoes, Colin had the Styrian beef schnitzel and boiled potatoes. The beef was liberally sprinkled with pumpkins. Very good. 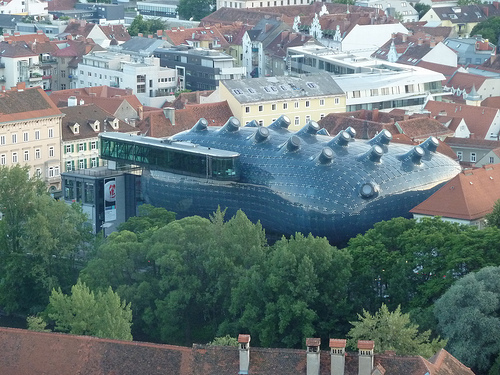 Graz Museum of modern art. Afterwards we went for a short walk and took the elevator to the top by the clock tower where there are excellent views over the city. 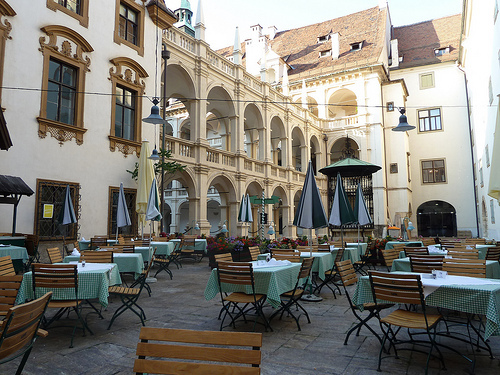 Graz is a quiet, graceful place and we don't feel we have really spent enough time here to do it justice. We have seen all the items recommended in the guidebooks but it is the sort of place where one would be rewarded by poking around, looking up and looking back. The architecture is amazing, everywhere you look there are items of interest. Best of all, there are few tourists.